Rammstein - Liebe Ist Fur Alle Da (Deluxe Edition). Title:Rammstein - Liebe Ist Fur Alle Da (Deluxe Edition). Your item will be previously owned but still in great condition. The disc will play perfectly without interruption and the case, inlay notes and sleeve may show limited signs of wear. 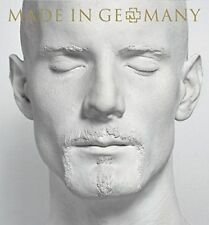 RAMMSTEIN - MADE IN GERMANY 1995-2011 CD NEU. Hier folgende CD / Here following CD Best of Album. Du Riechst So Gut. Progressive Rock. 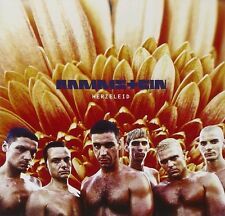 SEHNSUCHT by Rammstein (CD, Mar-1997, Motor) USA. Rammstein Sehnsucht CD. Released- 1997. CD - RAMMSTEIN - MUTTER. This CD is new, factory sealed, unplayed, original. All other countries 3-4 weeks. FEUER FREI! Official release, UNIVERSAL - 5496392. All disks in boxes. Photo taken from the sold disc. ========================================================================================================. Hier folgende CD Das alte Leid. Rammstein's debut album with the controversial German cover version. The case has surface wear. We are easy to deal with and will respond within 24 hours. What you see in the pics is what you get. Mutter 4:28. The CD has surface marks but plays perfectly. The Digipak Fold Out cover shows a bit of wear (Mainly light indentation marks mostly only visible when held to the light) but is generally in Very Good to Excellent condition. This CD is new, factory sealed, unplayed, original. All other countries 3-4 weeks. Official release, UNIVERSAL - 9868150. 4 KEINE LUST. 10 OHNE DICH. Artist: Rammstein. Album/Title: "Mutter ". Plastic case in excellent condition. Liebe Ist Fur Alle Da. Roter Sand (Orchester Version). Roter Sand. Ich Tu Dir Weh. Rammstein ‎– Liebe Ist Für Alle Da. Music By, Lyrics By – Rammstein. Producer – Jacob Hellner, Rammstein. 1-9 Liebe Ist Für Alle Da 3:28. Format: × CD, Album, Digipak, Slipcase. 'Special Edition'. 1-11 Roter Sand. Deutschland (RMX BY RICHARD Z. KRUSPE). RITUAL CD NEW . - RITUAL CD NEU. Hier folgende CD / Here following CD Seine Seele 11. Seine Seele. Lass' die Beute frei 10. Lass' die Beute frei. Phönix aus der Asche 9. Rammstein - Sehnsucht. Limited edition in a cross-shape fold-out digipak. Includes a folded 12-pan el insert. Sleeve state: the digipak has light wear and various small marks all around; the insert has several small marks. / 4-30 CD BB´S = 8?. (Shelf 168 ). Liebe Ist Fur Alle Da. Ich Tu Dir Weh. Wiener Blut. Fruhling in Paris. Format: CD. Warranty period is complied with manufacuture regulation. Condition : NEW. Back to top. We could receive bulk order, so we would appreciate if you could consult us! CD RAMMSTEIN "SEHNSUCH". New and sealed. TITLE: SEHNSUCH. AUTHOR : RAMMSTEIN. FORMAT : CD. Images shown may, occasionally, belong to a catalog and could vary to the ofered item. 95 (MAX 250gr). VERSION: MATRIX ES0067, 8-PAGE BOOKLET. THIS IS OFFICIAL UKRAINIAN RELEASE. LABEL:UKRAINIAN RECORDS / FOR SALES in UKRAIN E ONLY. For detailed information – see 3. NOT CD-R, NOT A FAKE. EMIGRATE - EMIGRATE (Scarce Limited Edition CD Album). The Digipak Fold Out cover is in Excellent condition. The Booklet is in Mint condition. The Special Outer Cover is in Excellent condition. YOU CAN'T GET ENOUGH. (RAMMSTEIN - Job Lot of 4 Very Rare Limited Edition CD Albums. 1) Mutter (Scarce 2 x CD Album - Tour Edition). 4) Liebe Ist Fur Alle Da (Scarce 2 x CD Box Set). RAMMSTEIN - Mutter (Scarce Tour Edition 2 CD Album). The Two colour booklets are in Excellent condition. Spieluhr - Live. Sonne - Live. In Arbeit - Live. Ich Will - Live. Artist Rammstein. Release Year 1998. Band/Title: Rammstein Sonne. Year of release: 2001. Label/Matrix: Motor Music 7 31458 76262 1. A double cd counts as 2 Cd's. Matrix Disc: 07314 587 626-2 01 / 51107351 Made in Germany By Universal M & L.
Live Aus Berlin. Hier folgende CD. Alter Mann. Spiel Mit Mir. Stripped 4:25. Stripped - Tribute to Dusseldorf Mix by Charlie Clouser 5:10. Stripped - FKK Mix by Gunter Schulz-KMFDM 4:35. =======================================================================. Du Hast (English Version). Engel (English Version). YOU ARE BUYING A USED CD.